Have you heard about the new FabFitFun fashion boxes? When placing the order for my last FabFitFun, I had the option to add a style box to my order for $20 and I did just that. If you want to see an unboxing, make sure to watch the video below. Otherwise, keep reading to see if FabFitFun has this style box thing down yet. As some of you may know, I love subscription boxes and I do reviews on all kinds of fashion and style boxes, so that you can find out if they’re something you might want to try out for yourself. When I was making my selections on the Spring Fab Fit Fun, I had the option to add a style box to my order for a $20 styling fee, so of course I did this so I could give the Artsy Cupcake Crew the scoop on this fashion box from Fab Fit Fun. I’m going to give you a quick run down of my experience and also show you the items I got. If you want to see me try everything on, make sure to watch the video above! I tried to find the exact items, but could only find similar ones, so did hyperlinks on the items I mention. This Spring was the first time I had seen this style box as an option on my Fab Fit Fun order, so I think it is a relatively new offering. After I added the fashion box to my cart, I waited for steps on what to do next. I knew it would be a March style box, so would arrive sometime in March, but usually there’s a questionnaire to fill out with these style boxes, so they have an idea of what to send you. I got curious after a few weeks of not hearing anything from them and looked around on the FabFitFun website but I couldn’t find anything about the fashion boxes, so I emailed them and got a prompt response with a link to fill out the form. Now, maybe their email on filling out the questionnaire got sent to my junk or something, but I did receive emails to check out, so I think it’s more of a communication error on their end. The items they sent me were good quality and the checkout process was easy. I just went through and selected what I wanted to keep on my phone and then mailed back what I did want in the included bag they had sent. I was trying to look back at my order, so I logged into my FabFitFun account and I can’t find the receipt of this style box or a history of the items I had received or any record that this style box transaction took place other than the few emails they had sent me. For example, with Trunk Club, I can see everything they sent me and then also what I ended up keeping, so it is a nice record of our transactions. So, I do think FabFitFun has some communication and technical issues they need to work out since this is a new offering. Overall, I will say this is a good style box and it compares similarly to other styling boxes like Fashom and StitchFix with a styling fee of $20 and 5 items to choose from. I have done reviews of those if you want to compare. Ok, now you know the scoop, so let’s look at what they sent me. Everything arrived nicely packaged in a large white box. The box came with a note from the stylist, the receipt, a mailing label and a bag to send back what you don’t want to keep. There were a nice variety of 5 items included in the box. The first item is this Daniel Rainn floral blouse which was $72. I thought that was a little high in price for this blouse, although it did have some nice details on it with the lace and cute tie up on the sleeves. It is a great Spring item and I liked it, but I didn’t $72 like it, so this was one that went back. Next, is a black dress with pink flowers from Collective Concepts. This had a pretty neckline and elastic on the ¾ length sleeves. There was a lot of static on this dress, so the skirt kept sticking to my legs. It was the type of material that felt like it would get hot really easily too, so I wasn’t really digging this one. 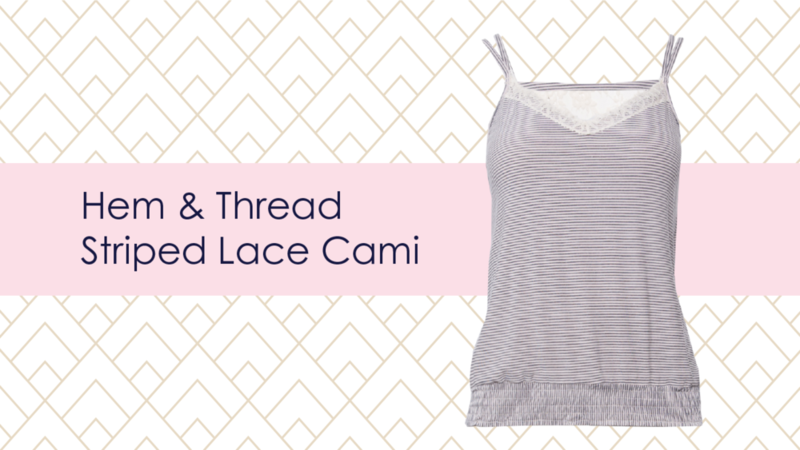 Next, was this pretty camisole from Hem & Thread. It had navy and white stripes and is $36. I feel that is a good price for this because of the nice details with the lace panel in the back and the gathered elastic trim at the bottom. And it went really well with the next two items I am going to show you. These navy trousers from the Dazz brand are $69. They are an ankle pant and are a nice lightweight material with a little bit of stretch to it. Perfect for spring and summer. We have a winner! The last item for this outfit was this Stoosh turquoise blazer. I loved the little gold buttons on the sleeve and it is a lightweight material with a little stretch. It is a great length and looks really cute over the camisole. I love this blazer and that is the item I ended up keeping from the box. Overall I do think FabFitFun has a few bugs to sort out, so if you do end up ordering this style box, just be patient with them and follow up if needed because they will get back to you quickly. I will probably be doing another one of these because it’s just so easy to add it on when you’re already checking out with your FabFitFun order. If you found this helpful, please leave me a comment below.